امیری, میثم, موسوی, زهرا, متقی, خلیل. (1397). مطالعه دگرشکلی پسالرزه‌ای زمین‌لرزه 2010 ریگان 6.5 Mw ، جنوب‌شرق ایران با تداخل‌سنجی راداری. مجله ژئوفیزیک ایران, 12(2), 96-108. میثم امیری; زهرا موسوی; خلیل متقی. "مطالعه دگرشکلی پسالرزه‌ای زمین‌لرزه 2010 ریگان 6.5 Mw ، جنوب‌شرق ایران با تداخل‌سنجی راداری". مجله ژئوفیزیک ایران, 12, 2, 1397, 96-108. امیری, میثم, موسوی, زهرا, متقی, خلیل. (1397). 'مطالعه دگرشکلی پسالرزه‌ای زمین‌لرزه 2010 ریگان 6.5 Mw ، جنوب‌شرق ایران با تداخل‌سنجی راداری', مجله ژئوفیزیک ایران, 12(2), pp. 96-108. امیری, میثم, موسوی, زهرا, متقی, خلیل. مطالعه دگرشکلی پسالرزه‌ای زمین‌لرزه 2010 ریگان 6.5 Mw ، جنوب‌شرق ایران با تداخل‌سنجی راداری. مجله ژئوفیزیک ایران, 1397; 12(2): 96-108. 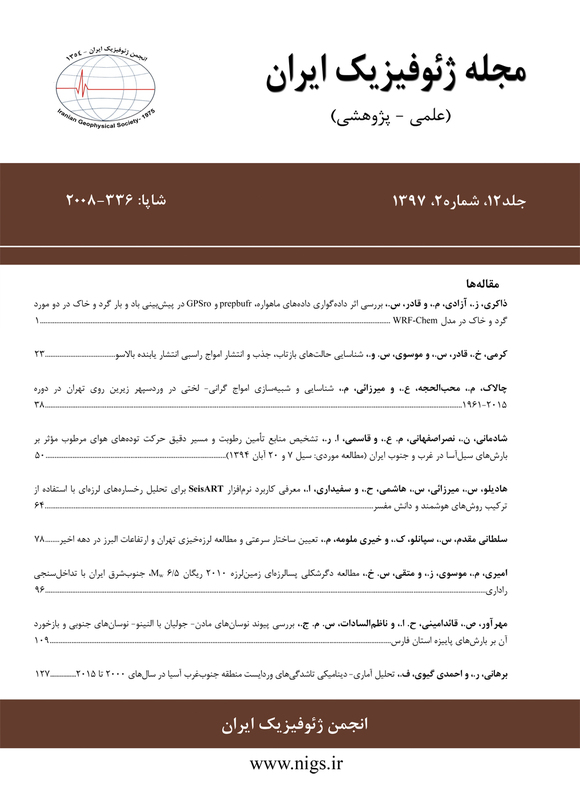 در 20 دسامبر 2010، زمین‌لرزه‌ای با بزرگای 5/6 Mw در منطقه ریگان واقع در جنوب‌ شهر بم رخ­داد. 37 روز بعد، در 27 ژانویه 2011 پسلرزه‌ بزرگی (با بزرگای 2/6Mw) در 20 کیلومتری زمین‌لرزه اول اتفاق افتاد. برای مطالعه دگرشکلی پسالرزه‌ای پس از وقوع زمین‌لرزه‌های فوق، تصاویر ماهواره COSMO-SkyMed (از آژانس فضایی ایتالیا) در بازه زمانی 27 ژانویه 2011 و 15 جولای 2011 تهیه و تحلیل سری زمانی روی تصاویر با استفاده از روش کوتاه­ترین خط‌مبنا (SBAS) انجام شد. نقشه میانگین سرعت به‌دست‌آمده از تحلیل سری زمانی کوتاه‌ترین خط‌مبنا، بیانگر وجود فاز پسالرزه‌ای با سازوکار راست‌بر در منطقه ریگان است. سری زمانی جا‌به‌جا‌یی دو طرف گسل مسبب زلزله اصلی، نشان­دهنده 8 میلی­متر جا‌به‌جا‌یی در مدت 5 ماه پس از زلزله است. پس از این مدت، فاز پسالرزه‌ای به اتمام می­رسد، گسل قفل می­شود و فاز میان‌لرزه‌ای با انباشت آرام تنش روی صفحه گسلی شروع می‌شود. تعیین پارامترهای چشمه فاز پسالرزه‌ای با استفاده از مدل اکادا (1985)، نشان­می­دهد که یک توزیع لغزش با بیشینه جابه‌جایی 1 متر، در زیر گسیختگی زلزله اصلی (در عمق 10 کیلومتری) و همچنین در لبه­های گسل متمرکز شده است. نتیجه مدل‌سازی نشان­می­دهدکه فاز پسالرزه‌ای مشاهده شده صرفا به­دلیل وقوع پسلرزه‌ها در بخش‌های مجاور گسیختگی اصلی، روی صفحه مسبب زلزله اول است. سازوکار این دگرشکلی، پس‌لغزش است. On 20 December 2010, an earthquake with Mw 6.5 occurred in Rigan, a small town in the desert south of Bam city. The earthquake epicenter was in a low population area so, luckily, it caused only few casualties. Five days later 76 aftershocks reported by Iranian Seismological Center (ISC). On 27 January 2011, another earthquake (Mw 6.2) stroke an area at ~ 20 km southwest of the first earthquake. Bam earthquake Mw 6.6 occurred in 2003 with 40,000 victims is one of the deadliest earthquakes in Iran which is located in shear zones at southeast Iran. Considering the active faults distribution of the region and aftershocks of the 2010 Rigan earthquake encouraged us to better investigate and model the post-seismic deformation related to the 2010 earthquake. Post-seismic syudying provides information about rheology of the surrounding region and improves our knowledge about the strain release after the earthquake. In this study, COSMO-SkyMed (from Italian Space Agency, ASI) images spanning the temporal interval between 27 January 2011 and 15 July 2011 are used to investigate the post-seismic deformation following both earthquakes. We applied the Small Baseline Subset (SBAS) algorithm for images to obtain the post-seismic mean velocity map and the relative deformation time series. 109 interferograms, post-seismic mean velocity map and the relative deformation time series obtained Mean velocity map shows that displacements of post-seismic phase are right lateral strike slip same as co-seismic mechanism. Time series analysis reveals a clear post-seismic signal exponentially increasing with time until reaching the rate of more than 8 mm/year which indicates the end of post-seismic phase and following inter-seismic phase, starts with steady stress accumulation. Later, we modeled the post seismic signal considering a dislocation on a finite fault in an elastic and homogeneous half-space that are the assumptions for the Okada (1985) model. Post-seismic results modeled by adopting a two-step approach: (1) a non-linear inversion performed to constrain the fault geometry parameters and considering a uniform slip, then (2) a linear inversion performed to retrieve the slip distribution on the fault plane previously obtained. The fault plane is split into 1×1 km patches along strike and down-dip. Determining fault parameters and slip distribution by Okada model, indicates that the slip is concentrated in downdip of the coseismic depth with 1.2 m slip and also at the edges of the coseismic asperity. This slip distribution indicates that “afterslip” is the mechanism for post-seismic deformation of the Rigan earthquake. رضا، م.، عباسی، م. ‌ر.، جوان دولویی، غ.، و سدیدخوی، ا.، 1393، شناسایی گسل مسبب زمین لرزه 29 آذر 1389 محمدآباد ریگان (کرمان) و سازوکار کانونی آن براساس تحلیل پس لرزه‌ها: مجله ژئوفیزیک ایران، 8(1)، 59-70. ملکی، و.، شمالی، ظ. ح.، حاتمی، م. ر.، 1391، مکان‌یابی مجدد زمین‌لرزه اصلی 29 آذرماه 1389 محمدآباد ریگان Mn = 6.5 و پس‌لرزه‌‌‌‌های حاصل از آن به روش غیرخطی: مجله ژئوفیزیک ایران: 6(4)، 96-111. Aghanabati SA (1992) Map of metamorphic rocks of Iran (1:2,500,000). Geological survey of Iran. Ambraseys, N. N., and Melville, C. P., 1982, A History of Persian Earthquakes: Cambridge University Press. Barbot, S., Fialko, Y., and Bock, Y. (2009). Postseismic deformation due to the Mw 6.0 2004 Parkfield earthquake: Stress driven creep on a fault with spatially variable rate and state friction parameters. Journal of Geophysical Research: Solid Earth, 114(B7). Barbot, S., Hamiel, Y., & Fialko, Y. (2008). Space geodetic investigation of the coseismic and postseismic deformation due to the 2003 Mw7.2 Altai earthquake: Implications for the local lithospheric rheology: Journal of geophysical research: solid earth, 113(B3). doi:doi:10.1029/2007JB005063. Berardino, P., Fornaro, G., Lanari, R., and Sansosti, E., 2002, A new algorithm for surface deformation monitoring based on small baseline differential SAR interferograms: IEEE Transactions on Geoscience and Remote Sensing, 40(11), 2375-2383. Berberian, M., 1990. Geological Quadrangle Map of Jazmurian, 1:250,000, in: F. Vahdati Daneshmand (Compiler). Geological Survey of Iran, K13, Tehran, Iran. Bürgmann, R., Ergintav, S., Segall, P., Hearn, E. H., McClusky, S., Reilinger, R. E., ... & Zschau, J. (2002). Time-dependent distributed afterslip on and deep below the Izmit earthquake rupture. Bulletin of the Seismological Society of America, 92(1), 126-137. Cheloni, D., Giuliani, R., D'Anastasio, E., Atzori, S., Walters, R. J., Bonci, L., and Stefanelli, G., 2014, Coseismic and post-seismic slip of the 2009 L'Aquila (central Italy) Mw 6.3 earthquake and implications for seismic potential along the Campotosto fault from joint inversion of high-precision levelling, InSAR and GPS data: Tectonophysics, 622, 168-185. Ferretti, A., Prati, C., and Rocca, F., 1999, Permanent scatterers in SAR interferometry: Geoscience and Remote Sensing Symposium, 1999, IGARSS'99 Proceedings, IEEE 1999 International, 3, 1528-1530. Fialko, Y., 2004, Evidence of fluid filled upper crust from observations of post-seismic deformation due to the 1992 Mw 7.3 Landers earthquake, Journal of Geophysical Research, Solid Earth, 109(B8). Freed, A. M., Bürgmann, R., & Herring, T. (2007). Far-reaching transient motions after Mojave earthquakes require broad mantle flow beneath a strong crust. Geophysical Research Letters, 34(19). doi:doi:10.1029/2007GL030959. Hanssen, R. F., 2001, Radar Interferometry, Data Interpretation and Error Analysis: Springer Science and Business Media. Hsu, Y. J., Simons, M., Avouac, J. P., Galetzka, J., Sieh, K., Chieh, M., Natawidjaja, D., Prawirodirdjo, L., and Bock, Y., 2006, Frictional afterslip following the 2005 Nias-Simeulue earthquake, Sumatra: Science,312, 1921-1925. Italiana, A. S., 2007, Cosmo-skymed system description and user guide: ASI-CSM-ENG-RS-093-A. Jónsson, S., Zebker, H., Segall, P., and Amelung, F., 2002, Fault slip distribution of the 1999 Mw 7.1 Hector Mine, California earthquake, estimated from Satellite Radar and GPS measurements: Bulletin of the Seismological Society of America, 92(4), 1377-1389, doi:10.1785/0120000922. Marone, C. J., Scholz, C. H., and Bilham, R., 1991, On the mechanics of earthquake afterslip: Journal of Geophysical Research, 96, 8441-8542. Massonnet, D., and Feigl, K. L., 1998, Radar interferometry and its application to changes in the Earth's surface: Reviews of Geophysics, 36(4), 441-500. Massonnet, D., Rossi, M., Carmona, C., Adragna, F., Peltzer, G., Feigl, K., and Rabaute, T., 1993, The displacement field of the Landers earthquake mapped by radar interferometry: Nature, 364(6433), 138-142. Menke, W. (1989) Geophysical Data Analysis: Discrete Inverse Theory. 1st Edition, Academic Press, San Diego, 289. Okada, Y., 1985, Surface deformation due to shear and tensile faults in a half-space: Bulletin of the Seismological Society of America, 75(4), 1135-1154. Peltzer, G., Rosen, P., Rogez, F., and Hudnut, K., 1998, Poroelastic rebound along the Landers 1992 earthquake surface rupture: Journal of Geophysical Research, Solid Earth, 103(B12), 30131-30145. Pollitz, F. F., Peltzer, G., and Bürgmann, R., 2000, Mobility of continental mantle: Evidence from post-seismic geodetic observations following the 1992 Landers earthquake: Journal of Geophysical Research, Solid Earth, 105(B4), 8035-8054. Ryder, I., Parsons, B., Wright, T. J., and Funning, G. J., 2007, Post-seismic motion following the 1997 Manyi (Tibet) earthquake, InSAR observations and modelling: Geophysical Journal International, 169(3), 1009-1027. Smith, S. W., and Wyss, M., 1968, Displacement on the San Andreas fault subsequent to the 1966 Parkfield earthquake: Bulletin of the Seismological Society of America, 58(6), 1955-1973. Vernant, P., Nilforoushan, F., Hatzfeld, D., Abbassi, M., Vigny, C., Masson, F., and Bayer, R., 2004, Present-day crustal deformation and plate kinematics in the Middle East constrained by GPS measurements in Iran and northern Oman: Geophysical Journal International, 157(1), 381-398. Walker, R., Bergman, E., Elliott, J., Fielding, E., Ghods, A. R., Ghoraishi, M., and Oveisi, B., 2013, The 2010–2011 South Rigan (Baluchestan) earthquake sequence and its implications for distributed deformation and earthquake hazard in southeast Iran: Geophysical Journal International, 193(1), 349-374. Nogol-e-Sadat, A.A., 1996. Geological Quadrangle Map of Iranshahr, 1:250,000 scale,in:M.R.Sahandi(Compiler).GeologicalSurveyofIran, L13, Tehran, Iran.